Ajwain, ajowan (/ˈædʒəwɒn/), or Trachyspermum ammi—also known as ajowan caraway, bishop’s weed, or carom—is an annual herb in the family Apiaceae (or Umbelliferae). Both the leaves and the seed‑like fruit (often mistakenly called seeds) of the plant are consumed by humans. The name “bishop’s weed” also is a common name for other plants. The “seed” (i.e., the fruit) is often confused with lovage “seed”. Ajwain’s small, oval-shaped, seed-like fruits are pale brown schizocarps, which resemble the seeds of other plants in the Apiaceae family such as caraway, cumin and fennel. They have a bitter and pungent taste, with a flavor similar to anise and oregano. They smell almost exactly like thyme because they also contain thymol, but they are more aromatic and less subtle in taste, as well as being somewhat bitter and pungent. Even a small number of fruits tends to dominate the flavor of a dish. The plant is mainly cultivated in Iran and India. Rajasthan produced about 55% of India’s total output in 2006. The fruits are rarely eaten raw; they are commonly dry-roasted or fried in ghee (clarified butter). This allows the spice to develop a more subtle and complex aroma. In Indian cuisine, it is often part of a chaunk, a mixture of spices fried in oil or butter, which is used to flavor lentil dishes. It is widely used in South Asian cuisines like Indian and Pakistani cuisine as well, and it is also an important ingredient for herbal medicine practiced there. In Afghanistan, the fruits are sprinkled over bread and biscuits. Hydrodistillation of ajwain fruits yields an essential oil consisting primarily of thymol, gamma-terpinene, p-cymene, and more than 20 trace compounds which are predominantly terpenoids. ^ “Trachyspermum ammi“. Germplasm Resources Information Network (GRIN). Agricultural Research Service (ARS), United States Department of Agriculture (USDA). Retrieved 11 December 2017. ^ “ajowan – Definition of ajowan in English by Oxford Dictionaries”. Oxford Dictionaries – English. ^ “Bishop’s Weed”. SPICES BOARD INDIA. Archived from the original on 14 October 1999. Retrieved 14 August 2015. ^ a b c d Aliza Green (January 2006). Field Guide to Herbs & Spices: How to Identify, Select, and Use Virtually Every Seasoning at the Market. Quirk Books. pp. 116–117. ISBN 978-1-59474-082-4. ^ Rajasthan Gov, Commissionerate of Agriculture. ^ Alan Davidson (2014). The Oxford Companion to Food. Oxford University Press. pp. 9–. ISBN 978-0-19-967733-7. ^ 1929-, Duke, James A. (2002). Handbook of medicinal herbs. Duke, James A., 1929- (2nd ed.). Boca Raton, FL: CRC Press. ISBN 978-0849312847. OCLC 48876592. ^ Bairwa, Ranjan; Rajawat, BS; Sodha, RS (2012). 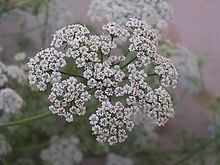 “Trachyspermum ammi”. Pharmacognosy Reviews. 6 (11): 56–60. doi:10.4103/0973-7847.95871. PMC 3358968. PMID 22654405. ^ Singh, Gurdip; Maurya, Sumitra; Catalan, C.; de Lampasona, M. P. (June 2004). “Chemical Constituents, Antifungal and Antioxidative Effects of Ajwain Essential Oil and Its Acetone Extract”. Journal of Agricultural and Food Chemistry. 52 (11): 3292–3296. doi:10.1021/jf035211c. PMID 15161185.